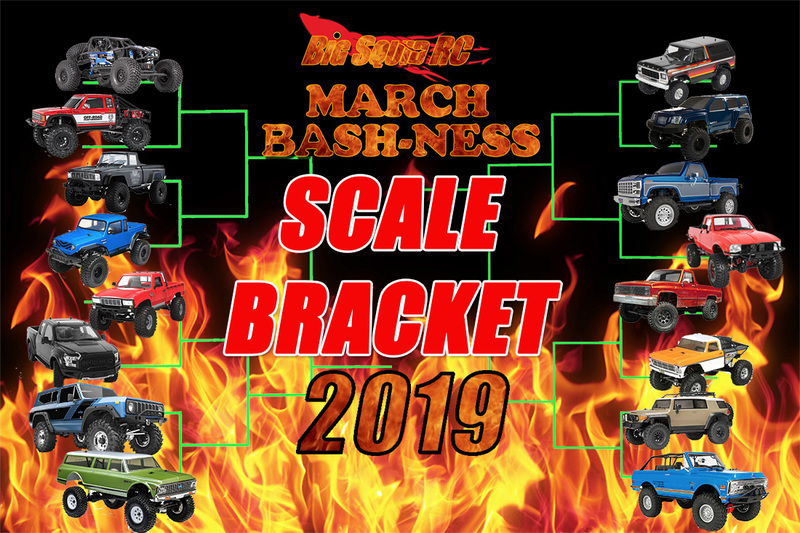 March Bash-ness 2019 – Scale Edition Round 1 « Big Squid RC – RC Car and Truck News, Reviews, Videos, and More! The other half of March Bash-ness 2019 has now officially started! Now remember, this is round 1 for the SCALE Bracket. We had so many great vehicles suggested for both the bash side and the scale side, we decided to go with a full 16 for each. We started with the bash bracket, and now it’s time for round 1 of the scale bracket! This is the 9th annual March Bash-ness, so by now most of you know how this goes, but for those new to the process, we ask that you look at the polls below and vote for which vehicle you think should move on to the next round. Where are those fanboys at? Lets see those votes! Don’t forget to share with all your friends and FB groups to help support your favorite bash vehicle, and send it on to round two! This voting round will have 4 days so you have till Midnight CST Tuesday March 26th, 2019, to get your votes in! As always, we WILL ban you if we catch you stuffing the ballot box. Please don’t make us do that. Thanks for voting! Tell your friends! Check back in a few days to see who moves to round 2!